No visit to Edinburgh is complete without a trip to Arthur’s Seat! Here are five suggested routes in the park, suitable for a range of abilities. Check them out on my map below. The colour scheme is my own, and the routes marked on my map. You won’t find any signposts or markers in the Park, but there are usually people to ask if you feel lost. Follow these routes at your own risk, and take care especially in poor visibility or high winds. But most of all enjoy Edinburgh’s top attraction! To find out more about the park, I highly recommend Discovering Edinburgh’s Volcano, a leaflet published by the Edinburgh Geological Society, and available from bookshops in Edinburgh. – from the Commonwealth Pool / Pollock Halls – the Holyrood Park Road entrance, for the Purple Route. Don’t miss this most famous of rock faces, tucked away just off the Radical Road at the south end of Salisbury Crags. The rocks are impressive. The hard dolerite of Salisbury Crags lies above softer sandstones; the junction between them is irregular, demonstrating how the dolerite is formed from intrusive magma that ripped up the existing sandstone layers as it squeezed between them. The rocks are famous for their link with James Hutton, 1726-1797, the ‘father of modern geology’. 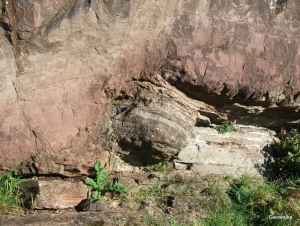 Hutton used these rocks to support his theory of an ancient earth, arguing that the sandstone and dolerite formed by different processes, and not at the same time. The route: From the Holyrood Palace car park, take the red paved path which climbs gently away from the road (not the steep path to Salisbury Crags, you’ll come back that way). At the first corner, the main path continues round into Hunter’s Bog (the Blue Route), but take the left fork and head towards the ruin of St Anthony’s Chapel. 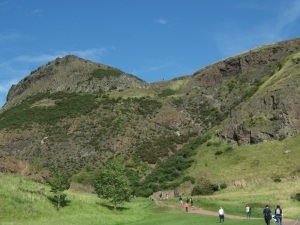 The line of cliffs leading up towards the summit of Arthur’s Seat is called the Lang Rig (or Long Row) and is the remains of a basalt lava flow. The easiest route is past the boulder marking St Anthony’s Well, and then follow the grassy path behind the Lang Rig. Or, if you prefer, you can take the path along the foot of the cliffs; they both meet higher up. A steady climb takes you to a rocky knoll with views to the east. You can see Dunsapie Loch below you. The worst of the climbing is over, and another five minutes climb along a rocky path (there are two to choose from) takes you to the top. Enjoy the views, if you can! Then return to the rocky knoll, and back down the path you came on, then take the first left fork and the path which gradually descends (with steep steps) round the west face of Arthur’s Seat. Eventually this path opens out into a grassy area at the end of Salisbury Crags, where you rejoin the Blue Route. The steep path leading up is the Purple Route, not for the faint-hearted. Continue straight on, with the suburbs of Edinburgh suddenly coming into view, then swing right onto the broad path along the base of the Crags – the Radical Road. Look out for Hutton’s Section on the right, just at the start of the road. The Radical Road takes you in a gentle climb along the base of Salisbury Crags, with great views of the Castle rock and the centre of Edinburgh. You then descend more steeply towards the Palace and your starting point. On the way down you can admire the folly atop Calton Hill, and the Scottish Parliament gleaming below. And that’s not the first time that the parliament and folly have been mentioned in the same sentence! The route: From the Holyrood Palace car park, take the red paved path which climbs gently away from the road (not the steep path to Salisbury Crags – you’ll come back that way). At the first corner, where the Red Route heads off for the hill, keep to the main path round to the right. Our route takes us through the broad valley of Hunter’s Bog. There are good paths on both sides, so you can cross to the left side of the valley, or stick to the right. The right-hand path is better, with a less steep climb. 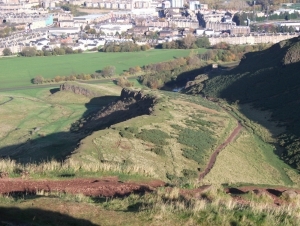 Towards the end of the valley, the paths climb with the steep slopes of Arthur’s Seat to be admired on the left. You eventually climb to a grassy area at the end of Salisbury Crags, where the Red Route joins us from the left. The steep path leading up is the Purple Route, not for the faint-hearted. Continue straight on, with the suburbs of Edinburgh suddenly coming into view, then swing right onto the broad path along the base of the Crags – the Radical Road. 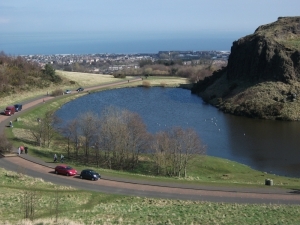 The Radical Road takes you in a gentle climb along the base of Salisbury Crags, with great views of the Castle rock and the centre of Edinburgh. You then descend more steeply towards the Palace and your starting point. The route: Drive or walk along the Queen’s Drive to Dunsapie Loch. There are a couple of obvious paths that strike up the grassy slopes from the road, heading for the summit of Arthur’s Seat. The paths cross ancient agricultural terraces, carved out by early farmers taking advantage of the well-drained soils. The paths converge close to the rocky knoll, my favourite viewpoint and rest spot. I once found a flint scraper lying on the gravel here, and I like to imagine its owner in the past also enjoyed the view. From here, the route is more interesting (there are two paths to choose from), and it is only 5 minutes or so to the top. The route: The adventurous way to the top. You start from the Holyrood Park Road entrance, just along from the Commonwealth Pool. Head across the grass to the end of Salisbury Crags, where an obvious path goes through a low point in the cliffs. The start of the track up to Arthur’s Seat is obvious once you cross the Crags. If you don’t like the look of it, there is an easier but longer path striking off to the left.If the weather is ok (not icy or windy), and you use common sense, you’ll probably enjoy the climb. It is a beautiful path, switch-backing steeply up and cutting over to the right to bring you onto the Nether Hill. Once you start up, the slope gets steeper but the exposure isn’t too bad. Stick to the path, and when you get to the end of the stone-pitched section, avoid the obvious route up to the left as this has a short tricky section of bare rock. 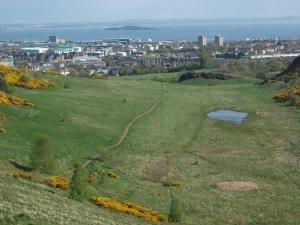 From the grassy summit of Nether Hill, there are several paths leading to the summit of Arthur’s Seat. 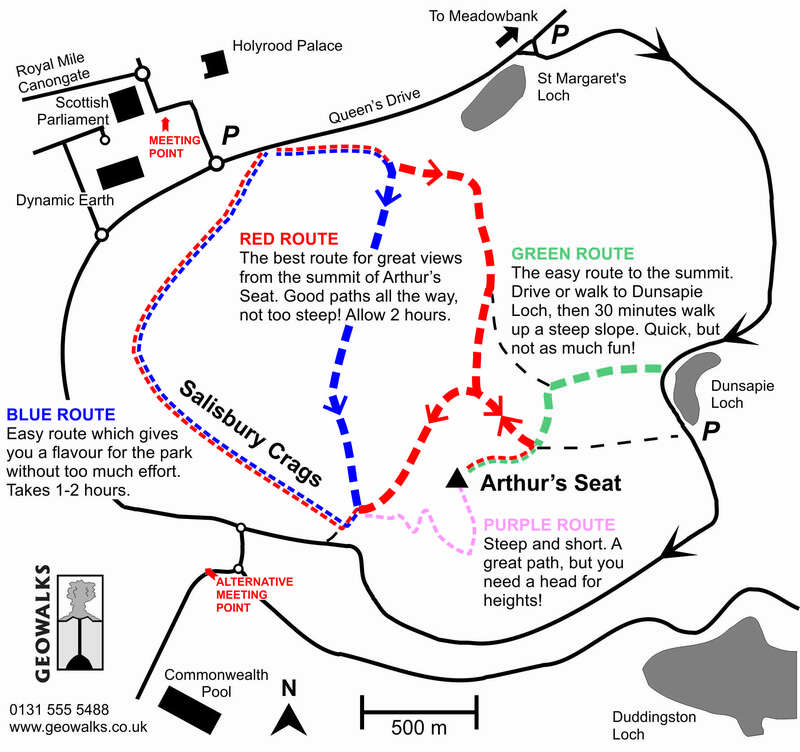 The route: This is a paved road, with pavement or footpath alongside, which circles Arthur’s Seat and Salisbury Crags. The eastern side climbs high into the wild side of the Park, while on the west the road is busier and swoops round the base of Salisbury Crags.You can start at any point, but if you are driving note that most of the route is one-way in a clockwise direction, and parts are closed to traffic on Sundays. From St Margaret’s Loch (the Meadowbank Entrance), the road climbs steadily to a high point at Dunsapie Loch – the Green Route to the top starts here. The road continues flat round the shoulder of Arthur’s Seat, and starts to descend once Salisbury Crags comes into view.